LA JOLLA—When you build models, whether ships or cars, you want them to be as much like the real deal as possible. This quality is even more crucial for building model organs, because disease treatments developed from these models have to be safe and effective for humans. Now, scientists at the Salk Institute have studied a 3D “mini-brain” grown from human stem cells and found it to be structurally and functionally more similar to real brains than the 2D models in widespread use. The discovery, appearing in the December 20, 2016, issue of Cell Reports, indicates that the new model could better help scientists understand brain development as well as neurological diseases like Alzheimer’s or schizophrenia. For years, cell biologists have been chemically prompting embryonic stem cells in petri dishes to develop (“differentiate”) into various types of brain cells. While researchers are able to glean a tremendous amount of information from these single layers of cells, the obvious limitation is that real brain tissue isn’t two-dimensional. In 2013, European investigators developed a method to grow embryonic brain cells in 3D gels, where they begin to differentiate into realistic layers like an actual brain. However, it was unknown how faithfully these lab-grown mini-brains, called cerebral organoids (COs), look and behave like real brains until now. Collaborating with the European lab that developed the protocol for growing COs, Ecker’s lab compared COs in early stages of brain development to real brain tissue at the same developmental stage. 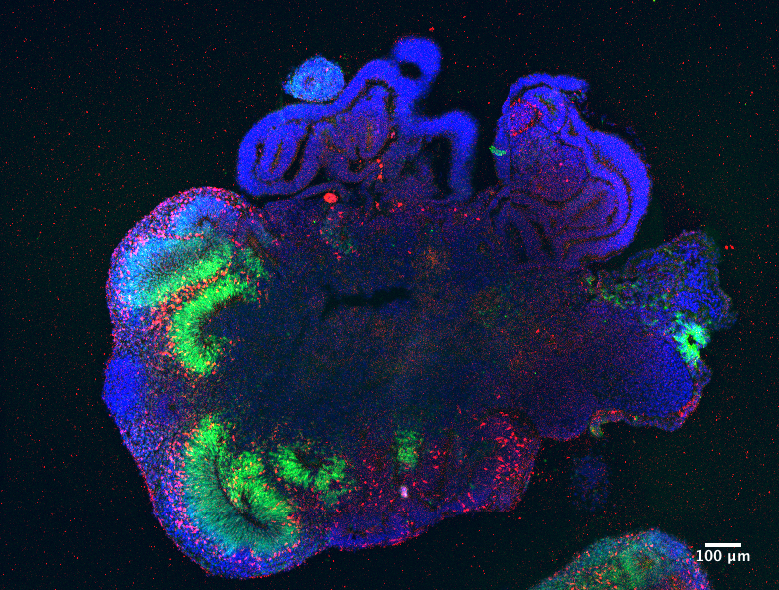 “Our work demonstrates the remarkable degree to which human brain development can be recapitulated in a dish in cerebral organoids,“ says Juergen Knoblich, co-senior author of the new paper and head of the European lab. 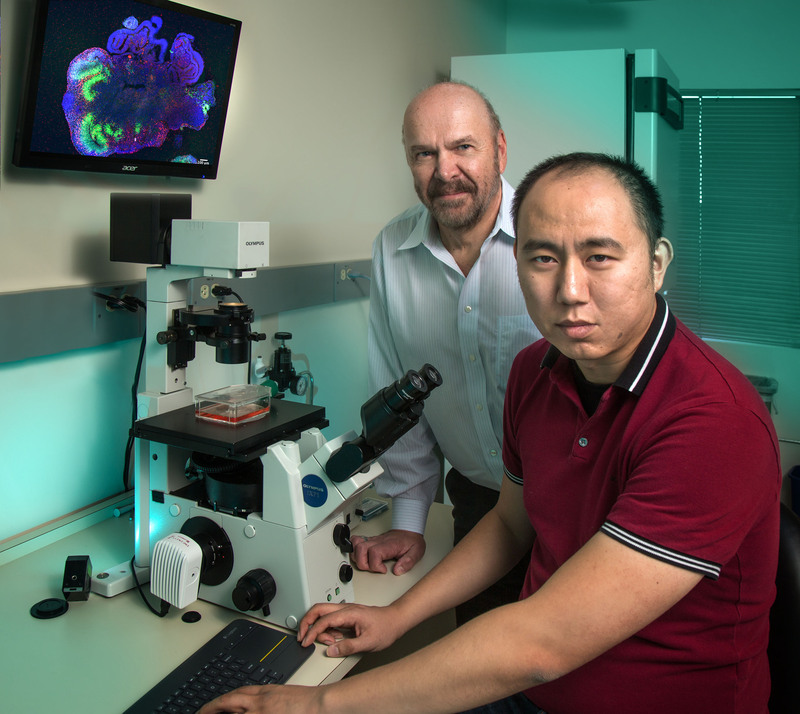 To create COs for analysis, the teams used a human embryonic cell line called H9, adding the right chemicals to induce the cells down a neurodevelopmental pathway for 60 days. They then analyzed the COs’ epigenetics, the pattern of chemical markers on DNA responsible for activating or silencing genes. Cells’ epigenomes—which are influenced by environmental factors like diet or stress—have been increasingly tied to development and disease (like schizophrenia). The team compared their results both to age-matched real tissue from the National Institutes of Health NeuroBioBank and other researchers’ 2D brain-model data. They found that COs were much more like real brain tissue than 2D models in the degree of differentiation the cells achieved and in their gene expression; in other words, COs develop along very similar early-developmental timelines as real brains, although they do not mature to the same level. When it came to epigenetics, however, both 3D and 2D models had similar aberrant patterns, which seem to be common to all cells grown in culture versus inside the brain. What this difference means is not entirely clear, but because it is so striking, Ecker suggests it could be a useful measure of how similar a model is to the real brain. “Our findings show that cerebral organoids as a 3D model of brain function are getting closer to a real brain than 2D models, so perhaps by using the epigenetic pattern as a gauge we can get even closer,” says Ecker, who also holds the Salk International Council Chair in Genetics. Other authors included: Rosa Castanon and Joseph R. Nery of the Salk Institute, and Madeline A. Lancaster of the Institute of Molecular Biotechnology of the Austrian Academy of Sciences. The work was funded by the Howard Hughes Medical Institute, the Gordon and Betty Moore Foundation, the Austrian Academy of Sciences, the Austrian Science Fund, the European Research Council, a Marie Curie postdoctoral fellowship and the Medical Research Council.